Earlier this year, we launched a survey to collect information about the adoption of flexible work practices within public accounting firms. In this blog in our Anytime, Anywhere Work series we focus on “place” — where employees are working – and we are encouraged to see some innovative new practices emerging this year in the surveyed firms. Of the 155 firms responding to the survey, 56% reported that they have employees who work from home occasionally and 35% who have employees regularly working from home, resulting in a combined 91% of firms offering work-from-home programs. This is up from 77% in the 2014 survey – a big jump! With recruiting as the number one issue facing most firms today, we were heartened to see that 45% of respondents employ remote workers in another geography not tied to a specific office, up from 37% in the 2014 survey. 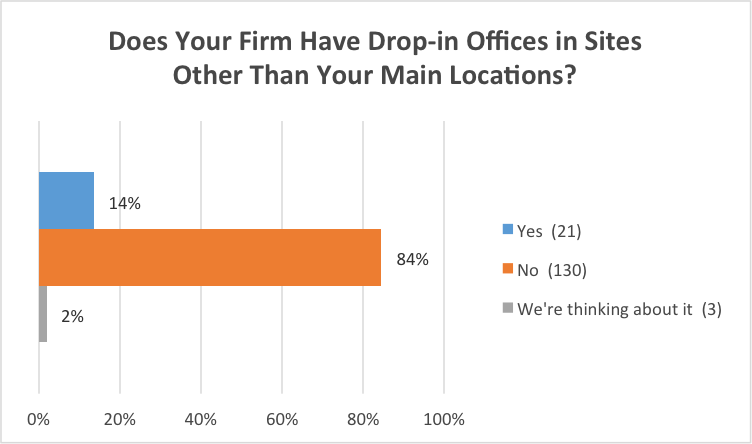 14% of our survey respondents have drop-in or satellite offices available for the firm’s employees. For firms in larger metropolitan offices, or whose offices are spread out geographically, commuting can create time constraints, stress and burnout for employees. Offering alternative work sites closer to home, or to the client’s office, can ease or alleviate those challenges. We expect this trend to grow over time as the Millennials become a more dominant force in the workplace and bring with them their discomfort with long commutes and the desire to use their time in the most efficient manner possible. Should You Reserve Office Space for Virtual Employees? The survey results demonstrate how respondents are handling office space for remote and work-from-home employees with 26% of respondents employing hoteling and open space concepts. We added this question in the 2015 survey because of all the inquiries we receive on the issue. Firms around the country find their growth constrained by a lack of space for employees, while office space usually ranks second on most organizations’ expense budgets. Both of these market challenges can be alleviated by offering work-from-home and remote work programs, but only if you then reimagine your use of the space you gain back in the office. Hoteling usually means that employees have no dedicated space and instead must reserve a cubicle or office for their time spent at the office. “Open space” concepts mean some portion of the office is configured like a hotel lobby with a variety of work areas and plenty of outlets for charging electronic devices. These open spaces can be used for drop-in work, as well as for socialization and collaboration. We expect both of these concepts to grow in popularity across the industry as virtual work increases and office space costs continue to grow. For additional information on creative use of office space, see SHRM’s Beyond the Open Office article or The Way We Work from Inside Public Accounting. 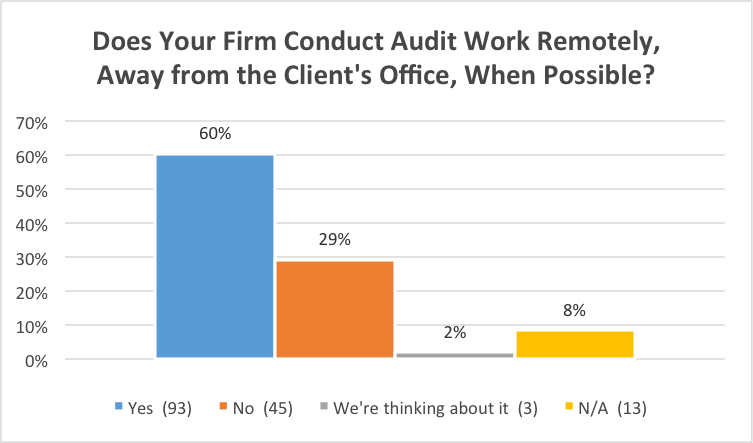 In this year’s survey, we asked three new questions about virtual auditing, or audit work performed away from the client’s office. 60% of survey respondents report that they perform some of their clients’ audits away from the client’s office. Of those firms who perform virtual auditing, 73% of the firms perform fewer than 25% of their audits remotely, 16% perform between 26% and 50% of the audit away from the client’s office, and 9% perform between 51% and 75% in this way. 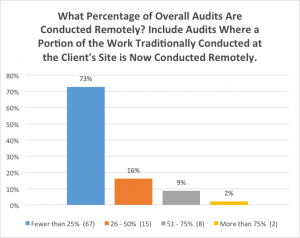 Only 2% of the groups are performing over 75% of their audits remotely. We asked a second follow-up question of the firms who are doing virtual auditing, requesting what percentage of the individual audit, on average, is performed remotely. 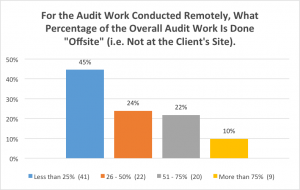 Almost half of the firms doing remote auditing are performing less than a quarter of the work offsite. 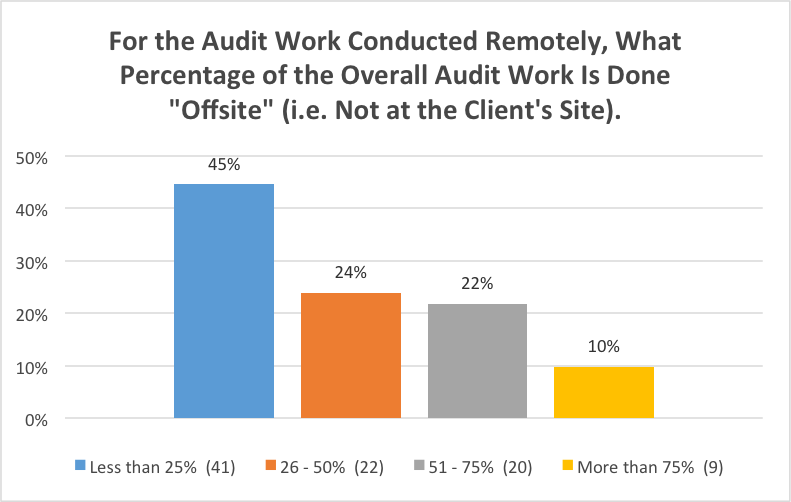 About a quarter of the firms are doing 26 – 50% of the audit work offsite, and another quarter are doing 51 – 75% this way. 10% of firms are doing more than 75% of the work offsite. The technology often times already exists in our firms to make remote auditing a reality. And, tech-savvy staff are ready to lead the way. But we often hear firms say that virtual auditing won’t work because of the client’s expectations to see staff working onsite – a questionable value in our minds, since clients might not really want a group of staff people taking up a conference room all week, and instead would prefer to receive more quality time from managers and partners, with some of that facetime occurring outside of the audit cycle. Objections and traditional views aside, we see tangible efficiencies and staff retention gains to be realized through virtual auditing. We expect to see changes in future years and will be watching these trends closely. We truly believe that flexible, virtual work is a key to recruiting, engaging and retaining young CPAs today – and serving young CPA clients tomorrow. In the upcoming final blog in this series, Tamera Loerzel will provide some guidance on an anytime, anywhere work policy including a sample you can leverage for your firm’s program. What kinds of changes can your firm pilot around “place” in 2016 to offer these crucial programs? We’d love to hear from you.